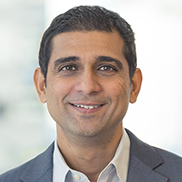 Vik Mehta - J. Goldman & Co., L.P.
Vik manages a growth focused team, where his primary areas of focus include Internet based investments, including companies in Media, Commerce, Smartphones, Payments and Software. Outside of the U.S., Vik’s team looks at investments in China, India and Latin America. Vik joined the Firm in 2002 and became a Partner in 2006. Prior to joining the Firm, Vik was an Analyst at Digital Century Capital from 2001-2002, a Vice-President at Goldman Sachs & Company from 1996-2001 and a Technology Analyst at Accenture from 1994-1996. Vik received a B.A. in Mechanical Engineering from the Massachusetts Institute of Technology.